Rangers manager Mark Warburton believes including his side and Celtic in a British league would help keep top-flight football fresh. The Englishman believes that, while there are a lot of hurdles to overcome, it will happen "sooner or later". "What dominates is TV money," said former Brentford boss Warburton. "It's a different financial climate down south than north of the border and they're always trying to keep the product fresh." Six years ago clubs in England voted against admitting Celtic and Rangers to a Premier League second tier, with the league's chief executive Richard Scudamore describing the proposal a "non starter". Despite that, Celtic majority shareholder Dermot Desmond has spoken this week of his hope that the wide attraction of Glasgow's two biggest clubs can bring about change. 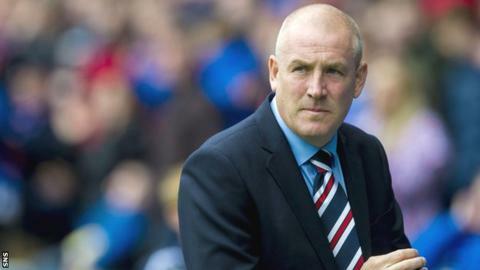 Warburton says "the global fan base and the attraction of Celtic or Rangers is obvious"
"You get to the stage eventually where team X and team Y don't have the same appeal to the average man on the street, whereas Manchester United versus Rangers or Celtic versus Arsenal etc is new, it's fresh, global fan bases - it's another level of excitement," Warburton said. "Ask any football people down south, they recognise the potential in clubs such as Celtic and Rangers. "But there are many, many hurdles to overcome - where would they go, what level, how would they get in, how do you start that process? "It'll take a smarter man than me, that's for sure. "Sooner or later, sometime in the future and I'm not saying near future, I'm sure that will happen." Asked if he fancied his squad's chances against some of the teams in England's Premier League, he added: "Let's be realistic here and keep the conversation serious, I think. "You have to respect the money down south, the work being done building squads and teams. It would be very foolish to be disrespectful of that fact. "The size of the clubs, the global attraction - don't forget they're starting to talk about Premier League games taking place in New York or this type of progression. "If that's the case, the global fan base and the attraction of Celtic or Rangers is obvious."